A couple of years ago I was gifted a subscription to the Reader’s Digest magazine. I read it from cover to cover while walking on the elliptical trainer at gym, to occupy my mind and stave off the boredom of walking for 15 minutes and getting nowhere! In the one issue I read about how baguette is meant to smell of apples or pears when torn open. I will be visiting France later this year and will test this out every day, as our lunch always consists of baguette with cheese and other accompaniments. When I read that Celia had used cider to feed her starter with great success, I decided that a good way to get the apple scent into my baguette would be to use cider together with the water in the preparation of the dough. I have tested this recipe for sourdough baguette using water only, and it works just as well, so if you do not drink alcohol and don’t cook with it, you can still make this baguette. I made one loaf with both apple cider and another with pear cider, as well as my perry and they each lend a lovely scent to the baguette. Have you ever smelt a loaf of bread when breaking it open? Love the idea of the cider in with the mix – fabulous! Hope you do try this! You can read at the gym – you’re my hero. I’d love to do it. Your baguette look amazing. I have never noticed that smell – I will have to check next time! Your baguette is beautiful. I love fresh bread! Oh thats brilliant, you read at the gym, Ive often admired the readers at the gym. 🙂 Oh that first sniff of a load as you crack it open is glorious. Now thats a great use cider, thanks for the tip. I was just telling Ryan that I really wanted to try making sourdough bread at home! I love this baguette! Would be perfect for sandwiches or with some pasta! Yum! 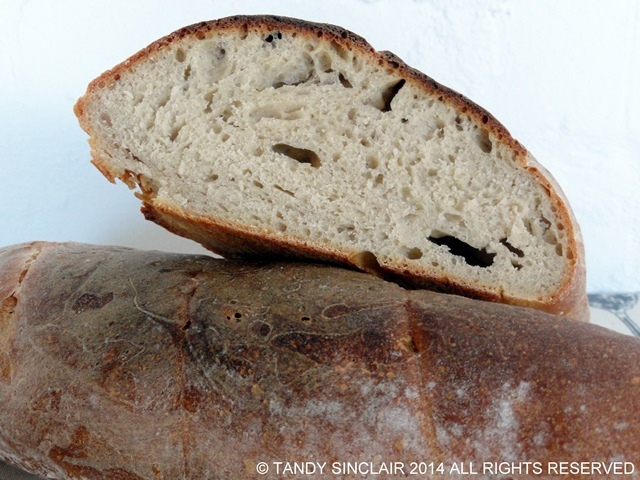 I yet have to bake with sour dough starter…great loaf of bread Tandy…I can only imagine how delicious it is. I really like your way of fighting boredom in the gym! I’ve always been curious to try making my own sourdough bread. It is one of my favourite bakery treats! So tangy and chewy. Love! I can’t say I’ve ever noticed my baguettes smelling like apples, but I can’t wait to hear what you find! Your baguette looks so delicious. A beautiful loaf! I get high with the smell of baked bread. Heavenly! Looks like a great loaf! Hi Tandy, how wonderful a trip to France! How clever to add a touch of cider to your base to create the aroma. This sourdough baguette looks scrumptious. Always love that smell of fresh baking bread. How lovely, a trip to France, would love to sample their breads and cheese! Some day. Hope you have a wonderful trip down the road.